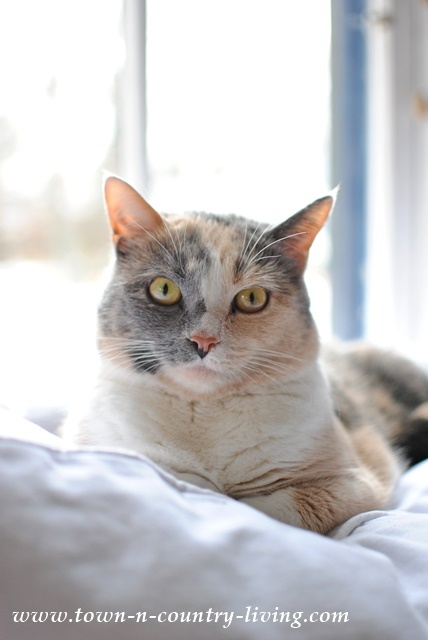 Hi, I’m Puddy and I’m my owner’s favorite kitty. She found me between her shed and the house one rainy spring day when I was just a baby and brought me inside. I’ve been here ever since and love my new home. Hi everyone! 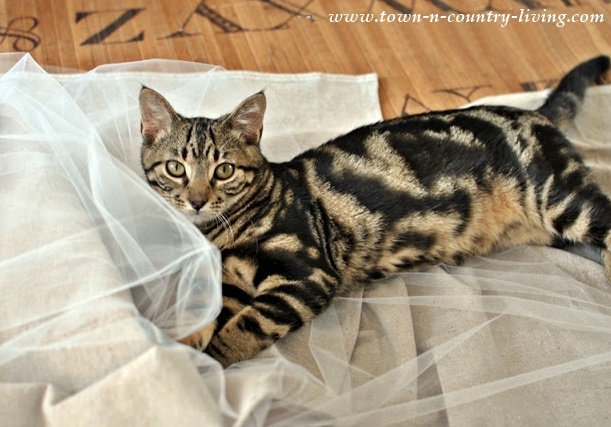 I’m Felix and I’m my owner’s favorite cat … she named me after her favorite childhood cartoon, Felix the Cat. She found me outside one day when I was just a wee one and brought me inside to live with some other rescue kitties. I’m the baby of the family! Don’t let my brothers fool you! I’m Stella and I’m also a rescue kitty and clearly the favorite in the family. Since we live in a small town near the country, there’s always a few stray cats like me hanging around. My owner has rescued a few of us and takes some of the others to the vet to get fixed to keep the population in check. We don’t need anymore kitties coming home to live with us! So anywho … the other day our mistress bought us some special treats to keep us happy. We love Fancy Feast. It’s a gourmet meal we all enjoy … although I do think I’m prettier than the cat on the can. I’m pretty sure my owner bought the Litter Genie for her own pleasure, as opposed to ours. But if it helps her keep our cat boxes clean, I’m all for it!! So back to the food … my brother Puddy seems to be enjoying his dinner. I’m sure it’s because Fancy Feast is made with high quality proteins which is critical to our feline health. I wish my brother Felix would learn to chew with his mouth closed. 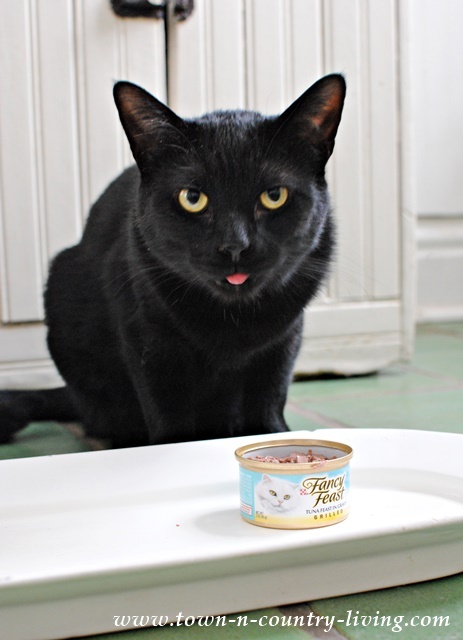 He clearly loves his Fancy Feast meal of culinary perfection! But seriously guys … it’s my turn to eat again! Our mistress needs to put the Litter Genie together after we get done eating. Thanks for the commentary, Stella. 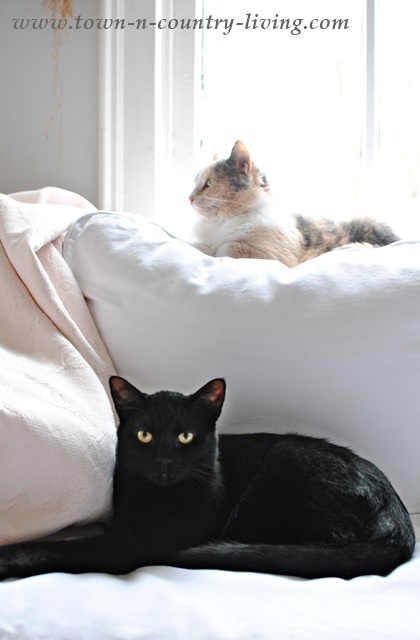 I hope you all enjoyed meeting my rescue kitties. 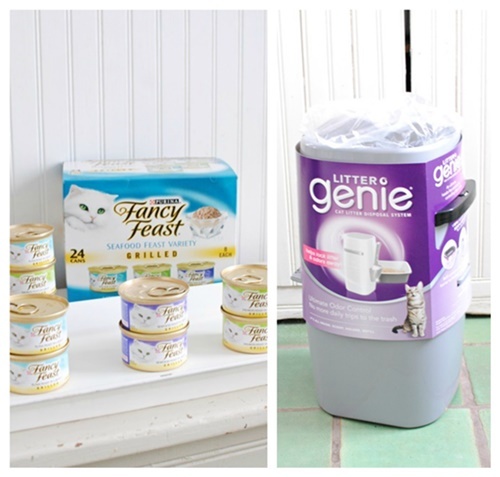 The Litter Genie is super easy to put together with its handy refill bags. You simply drop the refill unit into the top of the Litter Genie after pulling out a section of the blue bag to hold the litter (the instructions are very easy to follow). And using it is as easy as 1, 2, 3! 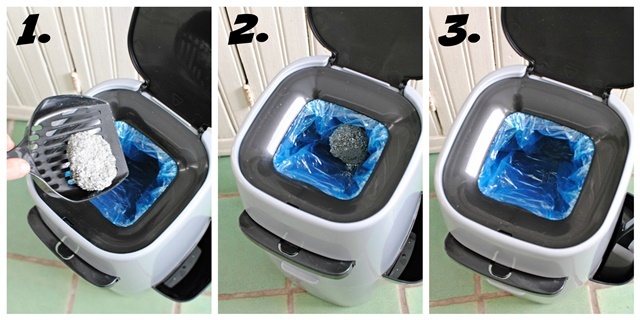 Simply scoop the litter clumps out of your cat box, open the lid and drop it into the Litter Genie. 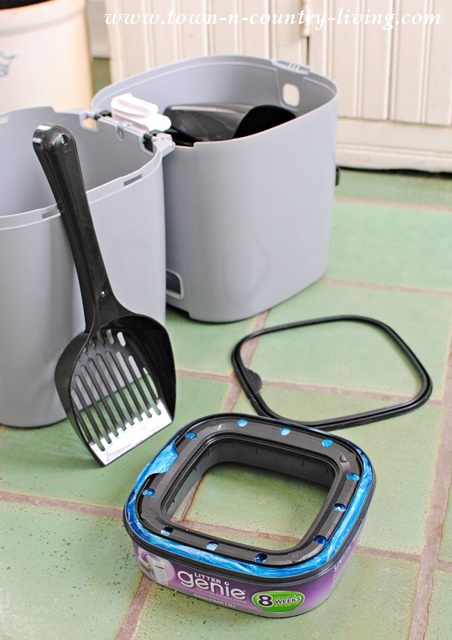 Pull the black handle located on the front of the unit to seal in waste and odors, and bye-bye stinky litter clump! 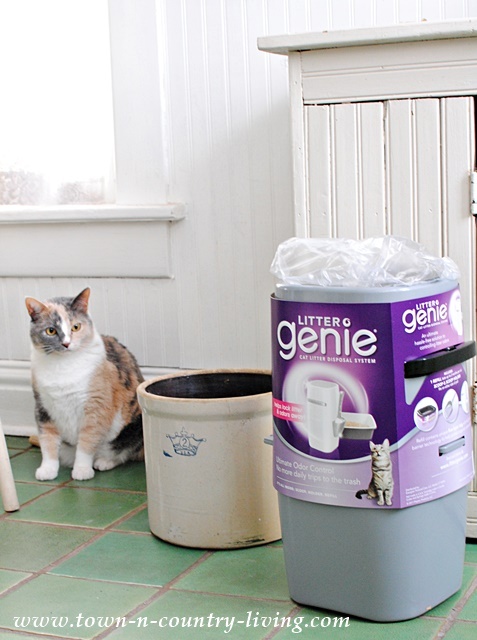 The Litter Genie seals away the the clumps and smell for up to 14 days for one cat! Since I have more than one cat I need to empty it more frequently. She had plenty of Fancy Feast to enjoy! 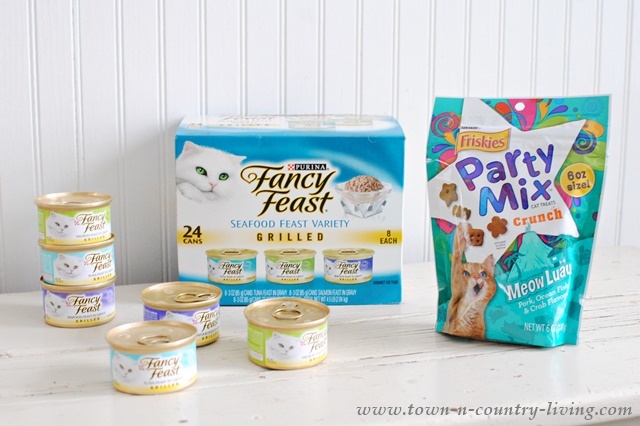 I bought my special kitty treats at Target and got the Friskies Party Mix for free! 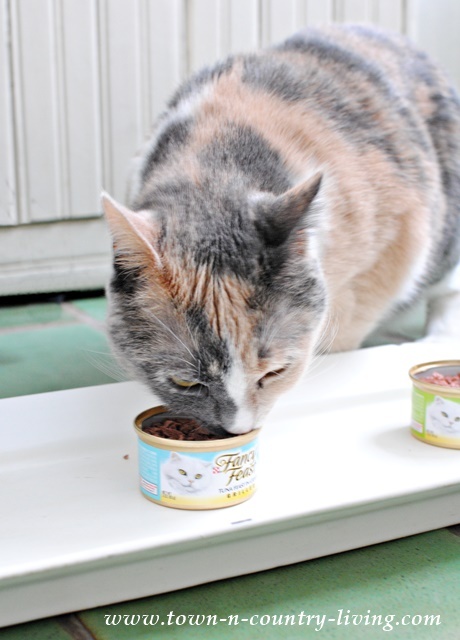 Target is offering an In Store Mix & Match Offer: Buy any TWO (2) Fancy Feast® – 24 pack OR Litter Genie® Pail/Refill and get a free Cat Toy or Friskies party mix cat treat. 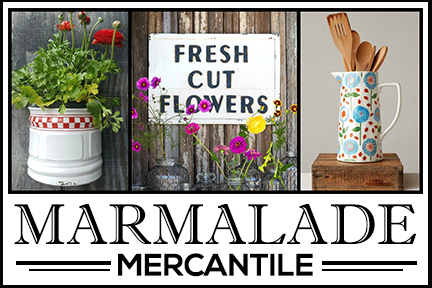 Offer available 2/15/15 – 4/11/15 while supplies last. Once meal time was over, it was time for a cat nap! My rescue kitties are inseparable and I enjoy keeping them happy. Awwww. 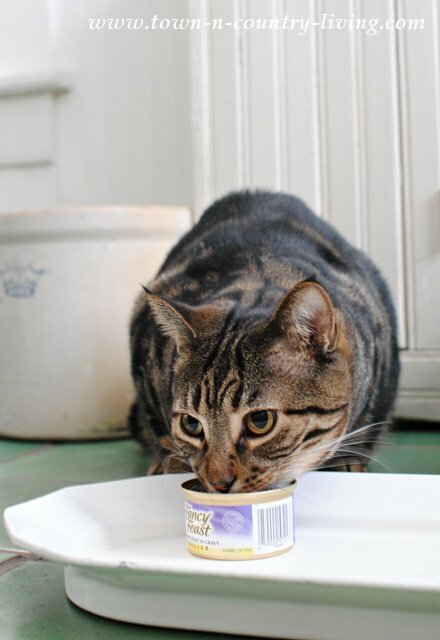 Your cats are so adorable, and they look like they really enjoy their yummy treats! Yes aren’t cats wonderful? I would not want to live without mine. They greet me every morning. 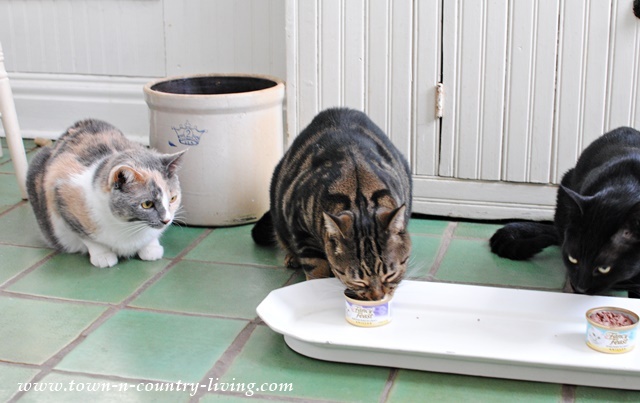 They love their wet and dry food and make lots of noise until the plate is on the floor and the bowls are filled. When it is treat time all you have to do is shake the bag and they all come running. 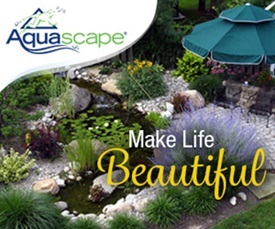 It even works when they are outside. Have a good day. What sweet cats! 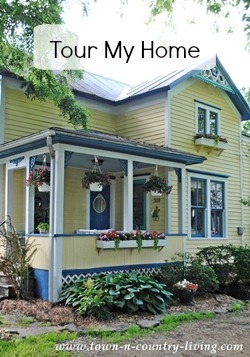 They have certainly found a fabulous home with you! I just got a Litter Genie and love lovelove it! Very sweet post, Jennifer! 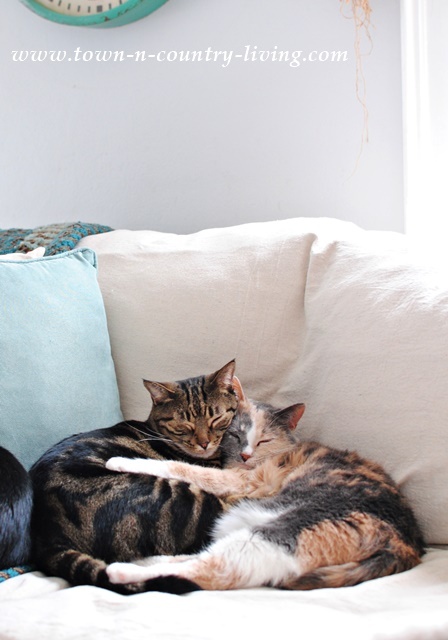 I have always been afraid of getting more than one cat thinking they will fight, but you seem to know the secret of how to have multiple cats live together happily. The genie looks good to try. For some reason our cat does not like the clumping litter. I may try it again. Loved reading your cats story and goodness you have a lot of strays in your area which is kind of nice in this case. Your cats are beautiful. I have 8 rescue kitties and if you gradually get then all used to the idea, they will all get along. I still have to scold them once in a while when things get too intense, but that doesn’t happen often at all. I think it helps to have several litter boxes. For my 8 kitties I keep 6 litter boxes and I scoop them out a couple times a day. Those are beautiful cats and they’re lucky that you took them in. I loved to hear from your 3 ‘favorites’. Nice to see 3 lucky kitties getting the love and care they so deserve. I am the cat mom of 4 girls who are the light of my life. They have my husband and I trained very well! 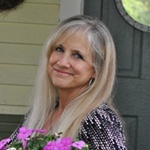 I love reading your blog, and now will enjoy it even more knowing it’s written by a cat lover!! Sweet!! Especially love the picture of the kitty’s sleeping together with Stella’s leg around Puddy. That is so cute. Thank you for adopting stray kitties. I did the same thing. Your Stella looks like my Carly.